Over one weekend in June we will be singing like blokes, acting like men and getting to be one of the guys. BlokeFest is a festival by good Blokes for good Blokes, who like singing or think they might if only they could do it in the right way. We organize a gathering of the Clans of Blokedom with fellas coming from the stronghold of Ashton Keynes in North, North Wiltshire, the dreaming spires of Oxford, the big Smoke of the London, Shanty Men from Ship-shape Bristol, hordes from the North and many other blokes from all points of the compass and beyond. Once gathered we will enjoy some sustenance﻿ then suitably nourished and invigorated we begin singing with the first Workshop to get us in the mood for the rest of the weekend. Workshop warm-up exercises making "scary faces"
Then it is over to the bar for some singing, some bar games, maybe some liquid refreshment, some singing, gathering around the campsite for a natter and bed at a reasonable time - it is a busy day ahead! To save you catering you can subscribe to Breakfast Specials at the Blokefest Clubhouse Café or it is D.I.Y. to get yourself roused and nourished for the day ahead. 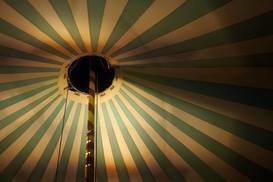 There will be numerous singing workshops throughout the day and learning blokey songs from some well-known singing men. Keeping you going throughout the day we will break for a ﻿communal lunch time﻿ meal, then some more singing and then a returning favourite from the last couple of years, the "Elective Session", where attendees pick one of the sessions that focus on a particular aspect of singing in smaller group. There will also be some more "CyberSinging" sessions where blokes who have been learning pieces via the internet finally meet in person to consolidate the songs in person. A bit more of a sing then we will assemble again for another meal before we congregate for the remarkable moment when we are entertained by the gathered throng with the world famous "BlokeFest Cabaret". We end the evening with more liquid refreshment and a bit more singing. To get you going there will be Breakfast Specials at the Blokefest Clubhouse Café or D.I.Y. We have a Sunday Morning Singing Workshop to remember what we learned the day before and then we do some things to encourage healthy pursuits, such as the legendary "Tonsorial Titan Challenge" where we judge who is the fairest hairiest in all the land, and the testosterone engendering "Tug o' War" contest where blokes get suddenly everso politely competitive! We then plan to have our "Class of 2019" photo session with our official BlokeFest PhotographerMeister taking the one BIG BlokeFest photo of everyone resplendent in their BlokeFest T-Shirts. 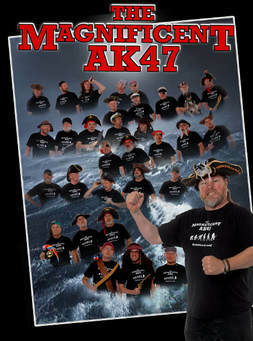 It is now traditional to wear your T-Shirt with pride that announces that you are part of this great bunch of blokes. 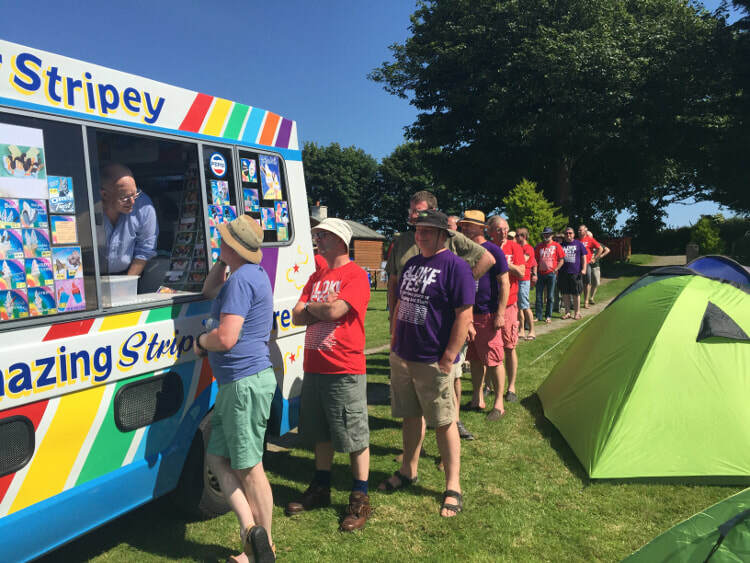 And we are also seeing if we can organize the return of an Ice Cream Van, and maybe a little something more as well...! And to finish off this year we are planning a BlokeFest Concert! when we have a have a final song or more to entertain ourselves and locals, then break camp and head home. Registration will open in good time but for now, here is what you got for your ticket money this year. Please note, there are currently no plans for Saturday Day Only Tickets at BlokeFest 2019 - it's the full weekend or nowt. Click on the button below to get signed up for "BlokeFest Up North". BlokeFest is the deranged brainchild of The Magnificent AK47, (depicted in some of their manly glory to the right) - they're the Singing Blokes of Ashton Keynes of North, North Wiltshire in the border badlands with Mid South East Gloucestershire. They’ve been singing and performing their own brand of testosterone stoked tomfoolery since 2008 and wanted to share the adventure with other men so dreamed up BlokeFest. 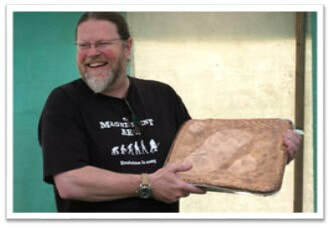 Visit their website at themagnificentak47.com to read about their many, many adventures and their 10th anniversary. One of the (many) interesting aspects about BlokeFest has been how we have moved to different venues to suit our needs over the years and just how many blokes have travelled a long, long way to be with us. 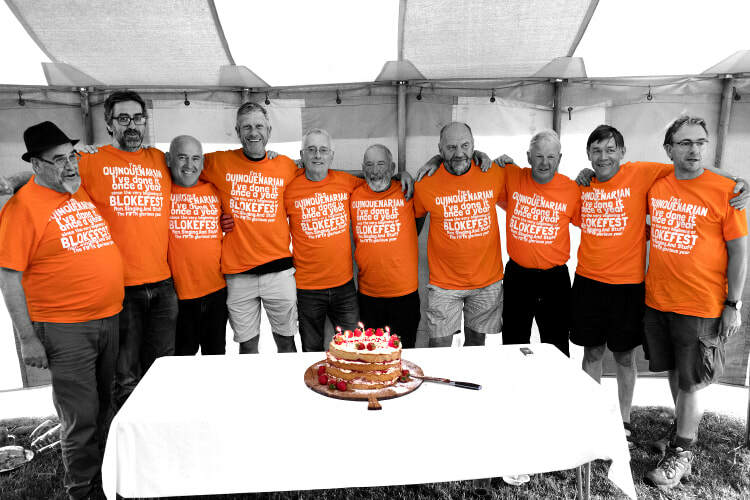 For a few years now we have had a bunch of blokes venturing down from the Ilkley / Skipton area and for 2019 we are very pleased so say that these intrepid bunch of blokes have offered to run the show around their neck of the woods. All are veteran BlokeFesters so know what's what and how to put on a good do. In 1963 he became the first BOY in his school's history to get GCE ‘O’ level Cookery, that’s why he's BlokeFest Up North’s Catering Superintendent. When he read that ‘all men can sing’ he went along to ‘Sing Your Rocks Off’ to prove them wrong, three years later he's still loving it and getting better, we hope! It’s his fourth time at BlokeFest and proud to be part of the group inviting you all to ‘God’s own county’. You’ll notice him as the one running around with a clipboard cajoling everybody to stick to the schedule and trying to ensure everybody has a great time. Really wanted to be an RAF fighter pilot but was barred because of his colour blindness and so went into the next most exciting career path, Accounting. This could be why he's been nominated as Accounts Officer for BlokeFest Up North and not for commissioning the t-shirts. Spent a career selling big computer systems when all he wanted to do was sing. Retired and started ‘Sing Your Rocks Off’. Best job he's ever had. Very much looking forward to welcoming ‘Blokedom’ to BlokeFest Up North. 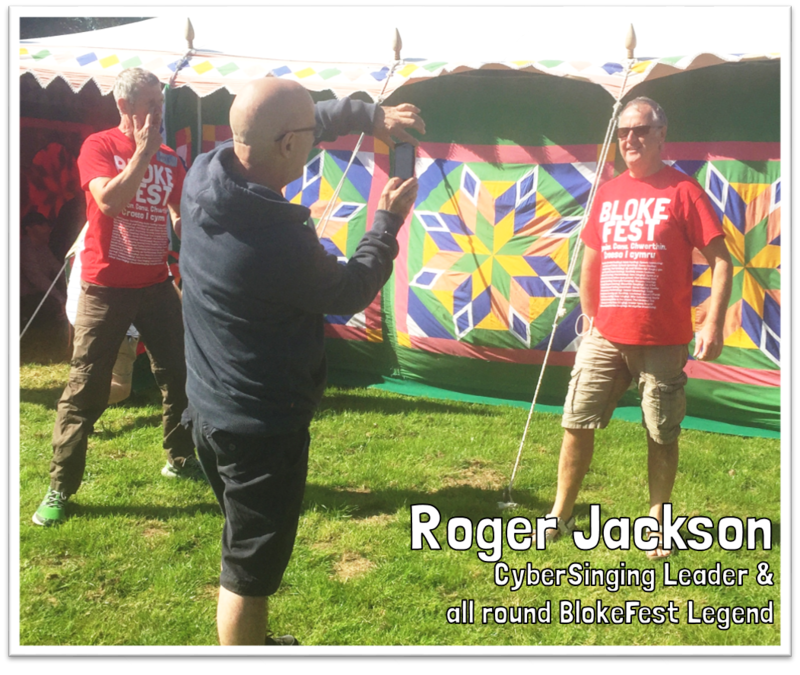 At BlokeFest we pride ourselves with being able to get some of the absolute top talent of the Choir Leaders and have helped many nurture their careers with our special "BlokeFest Experience" of harnessing our motley crew into beautiful harmony singing in a ridiculously short time. Here are this year's talented bunch but please note sessions and timings still to be confirmed. The embodiment of a top singing bloke if ever there was one. He leads five community choirs including The Magnificent AK47 and performs with the awesome Spooky Men's Chorale when they tour the UK and Europe. He is also one of the Artist Curators for the Nationally recognised Voices Now. He enjoys legendary status with all who know him for being a very generous performer and a gifted teacher - you should hear what he has managed to do with The Magnificent AK47, turning them from a bunch of pot bellied blokes from North North Wiltshire to being "the sound of testosterone" and a formidable sonic formation and a terrific show. 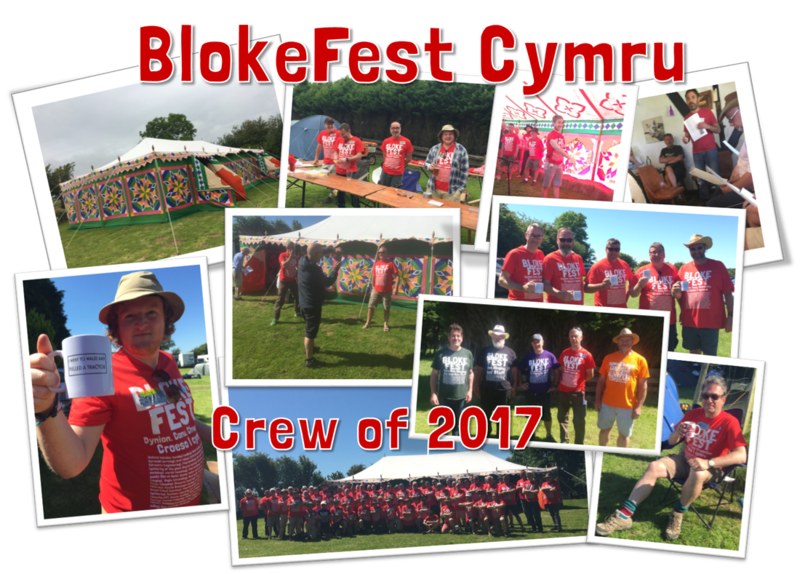 He has been one of the blokes most instrumental in making BlokeFest happen from the very beginning and must have helped hundreds of blokes to #getmensinging and is looking forward to helping many more enjoy the highlight of the summer at this year's event. Find out more from http://www.singingwithattitude.com/ and he currently gigs with an offshoot of those Aussie blokes in the UK version A Fistful of Spookies. It is with great pleasure that we welcome back Dave as one of our Workshop leaders after last year's return but this time just a few miles away from his home stomping ground. 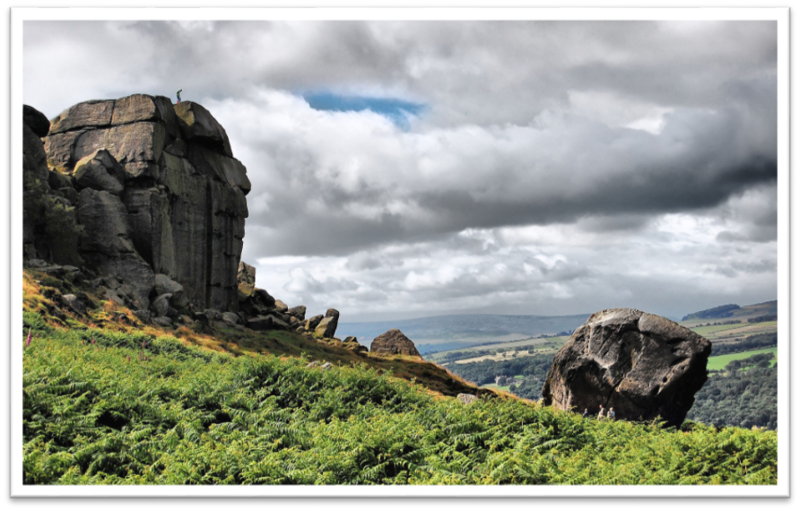 Dave is based in and around the Ilkley, Otley & Skipton triangle and runs many choirs himself and with other leaders on a range of top singing holidays. It all sounds like a fabulous way to spend your time! Dave was one of our original leaders and taught us the mesmerising Myfanwy which is still part of The Magnificent AK47 top pieces for melting the hearts of ladies across the land. More info can be found at his Natural Voice Practioner page with links to other sites and all his various activities and events. We are After his brilliant session at BlokeFest 2014, 2015 and running 'BlokeFest Cymru' in 2017, we are delighted to announce that James has been lured back to enthrall us with his musicality and good blokeyness. James is an experienced and dynamic vocal leader, dedicated to getting all people singing, and is super talented and a top bloke to boot! He runs choirs in schools, workplaces and community settings with an emphasis on fun and inclusivity. James is passionate about getting men singing and has directed The Bebington Bitter Men who were a great addition to the BlokeFest gang since 2014 and hosted us in 2017. He directs several open-access choirs across Wirral, Cheshire and North Wales with a specialism in a cappella singing. His choirs perform a mixture of traditional and contemporary music from around the world in beautiful three/four part harmony - guaranteed to make you feel good and put a smile on your face. He is also a member of the all-male a cappella troupe The Spooky Men’s Chorale and their UK off-shoot A Fistful of Spookies, with whom he has performed at major European festivals and on BBC Radio 2 & 3 and who you can see in action again this summer. More info at http://www.jamessillsmusic.co.uk and follow James on twitter @jsillsmusic or hear him in action on his Podcast at http://www.jamessillsmusic.co.uk/podcast.html. A new innovation and MASSIVELY popular at BlokeFest 2015 was the introduction of "Optional Sessions" where the attendees get to chose which session they want to, er, attend, if at all. The plan is that you will work on a piece or two that you can bond together and maybe showcase in the BlokeFest Cabaret later that evening. 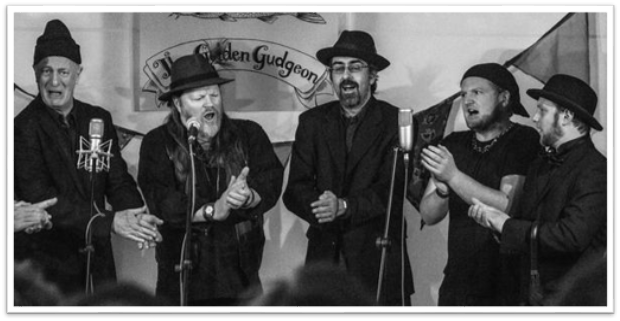 Philip (in the middle of his mates in the Fistful of Spookies) is a much loved and experienced community choir leader, workshop facilitator and professional singer. He runs three choirs in his home town of Oxford including 'MAN CHOIR', Oxford's 50-strong men's community choir, and 'Singing Saturdays', which brings together up to 100 mixed voices in stunning historic Oxford venues. In his work as a singer Philip appears regularly with a cappella group The Spooky Men's Chorale, with whom he has completed sell out national and international tours, live sessions on BBC Radio 2 and 3. and headline sets at Sidmouth, Towersey and Shrewbury Folk Festivals. Philip is also a member of several other vocal groups, including touring ensemble 'A Fistful of Spookies'. Find out more about Philip at http://manchoir.co.uk and http://www.singingsaturdays.co.uk. ​Jamie is a choir leader based in Caernarfon. He runs the Gwaenysgor Community Choir as well as the Greenhouse Singers in Bangor. He also acts as a guest leader for Dolgellau's Community Choir, Swnion and has run numerous sessions at a number of singing camps over the years and was a big hit at BlokeFest Cymru in 2017. As well as having a background in Community singing, Jamie grew up competing in the Eisteddfod, the Welsh language festivals of literature, music and performance. He also sings with the nationally recognised mixed voice choir Côr Dre. He'll therefore be bringing a Welsh flavour to Blokefest, or should that be "Gŵyl yr Hogiau"! Jamie has also been co-opted into the Fistful of Spookies as part of the widening brotherhood of song. No need to worry about signing up just yet, all that happens at the event itself. It is with immense pleasure that we welcome back once again composer, singer, choir leader, guitarist, Bluegrass mandoliner extraordinaire and the general all round BlokeFest Legend that is Roger Jackson. We have been lucky enough to his presence since the very first BlokeFest when he taught us his very own composition "(Alone in my) Shed" which has been a firm favourite of The Magnificent AK47 ever since, only to be surpassed by another "BlokeFest Special", the phenomenal "Man flu". Roger's infectious enthusiasm is ideal to help nurture along whoever turns up to join this unique "for one night only" choir. More info can be found at the CyberSinging Stuff 2019 page. The venue is Ilkley Rugby Club set on the banks of the River Wharfe and on the edge of the famous Ilkley Moors in the beautiful Wharfedale Valley of the Yorkshire Dales. Centrally located in the pretty spa town of Ilkley, the town’s rugby club is an ideal site and offers fabulous facilities and glorious views. Locate the traffic lights in the centre of Ilkley town. On the four corners are a Church, The Dalesway Hotel, The Crescent, and a gents outfitters. If you are coming from the West (Skipton) turn left, From the East (Leeds/Bradford) turn right. Cross the river and you will see the ground on your right. For a personal route map follow this 'map' link, insert your starting location/post code at 'A', click the 'get directions' button and print off your directions/map. Leeds/Ilkley or Bradford/Ilkley trains every half hour on the Wharfedale line. The venue is only 10 minutes walk from the railway station. 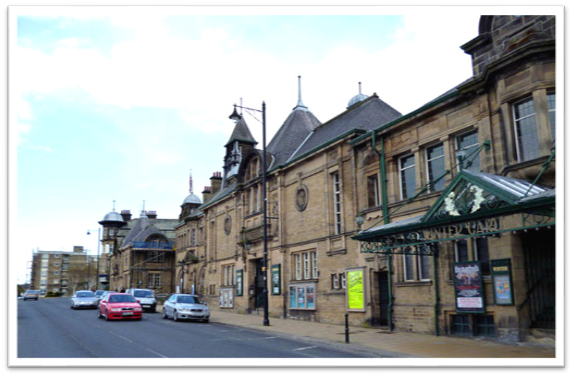 Good bus services to Ikley from Leeds, Bradford, Keighley, Skipton and Otley. Leads and Bradford airport is only a 15 minutes drive away! Local driver tips for Friday afternoon avoiding potential delays in Leeds or Bradford. If traveling via M1, stay on M1/A1M to junction 45, follow A659 to Otley, then signs for Ilkley. If using M6, avoid Colne Lancs, by continuing on M6 to Junction31, then follow A59 to Clitheroe, Skipton, then A65 to Ilkley. No need to worry about signing up just yet, all will be revealed soon, but you can read more on the CyberSinging page. In case you still need convincing, have a look at our video from BlokeFest 2016. 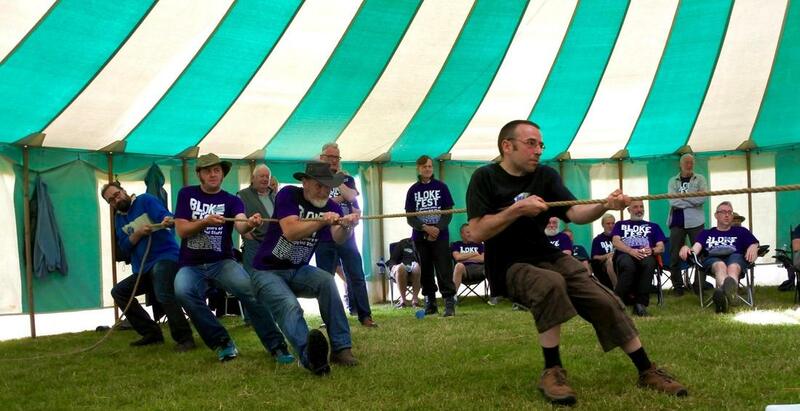 “BlokeFest has always been surprisingly good fun but BlokeFest 2016 surpassed all others. It was just brilliant from start to finish. Some great pub singing, amazing workshops, quite stupendous range of talent in the Cabaret and most of all a wonderful relaxed and friendly atmosphere. And to top it all the Concert Party was just such a wonderful example of simple, heartfelt fun - can't wait till the next one, I'm smiling already thinking about it." A very satisfied BlokeFest 2016 attendee. One of very many! 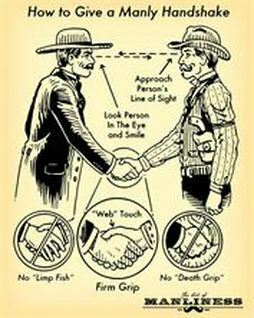 "Speak with a man, and he becomes your friend. Sing with a man and he becomes your brother. And we have brothers all over the country." A rather emotional and very happy BlokeFest 2016 organiser! You can find most of the "Frequently Asked Questions" and "Occasionally Asked Awkward Questions" by clicking here.